In case that you have WSUS server separated from the Internet, you can’t get updates directly. 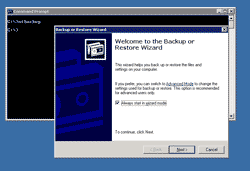 Microsoft has provided a solution by setting up another WSUS server which can connect and update from the Internet. Next, download updates from the Internet to this server and then export updates and metadata to files and copy (may be via backup tape) to the WSUS server which is on the disconnected network. 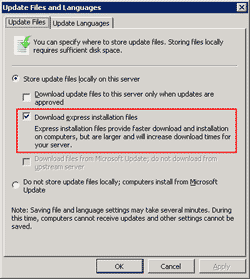 Make sure that on the advanced synchronization options for the express installation files features and languages on the exported server match the settings on the imported server. Export files and metadata from the exported server. 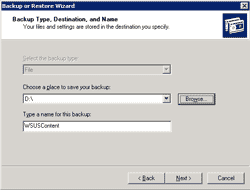 Export files will be done by using ntbackup command and metadata which is description and detail of updates will be export by using wsusutil.exe. Import files and metadata to the imported server. Import files and metadata will be use the same process as when export. In the following example, I’ll configure to enable express installation files features so that both server required to enable this feature and the langauge is only English. Since this topic is quite long, it will separate into 2 posts. In this post, I’ll show only first 2 steps. Note: You required local Administrative privilege on both WSUS server to perform this. 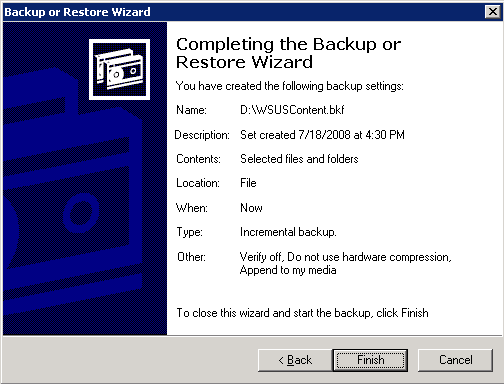 The wsusutil.exe tool can only be run on a 32-bit platform. 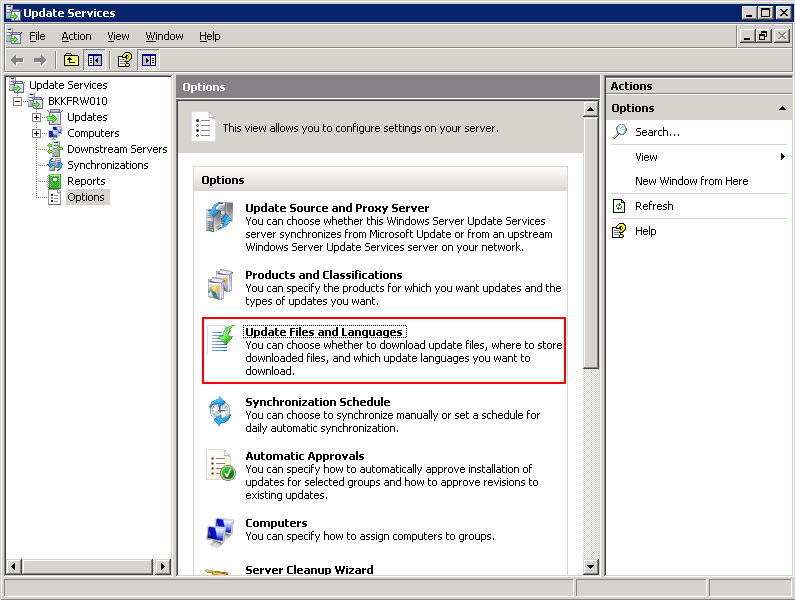 Open Update Services, select Options -> Update Files and Languages. 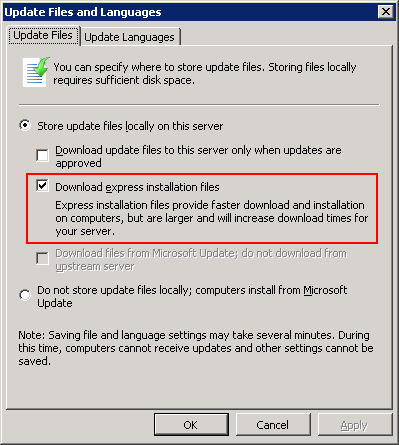 On Update Files tab, ensure that “Download express installation files” is checked on both exported server and imported server. 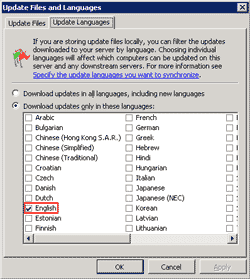 On Update Languages tab, ensure that only English language is checked on both exported server and imported server. 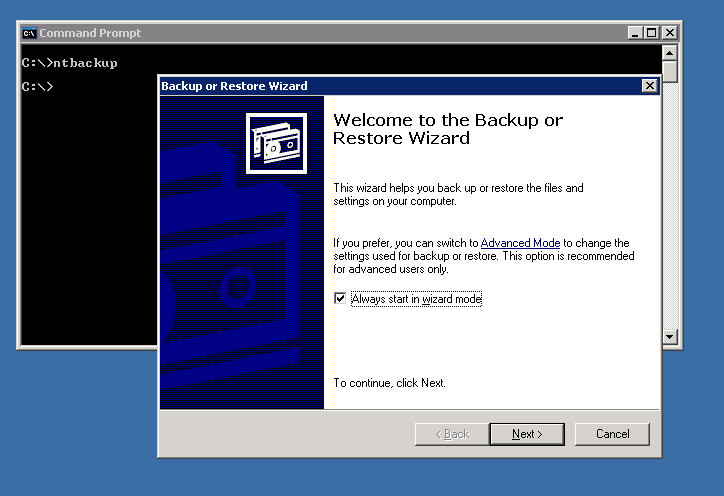 On the exported server, type ntbackup on command-line. 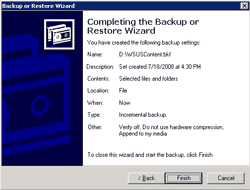 The Backup or Restore Wizard appears. Click next. 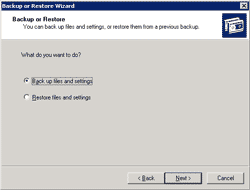 On Backup or Restore, select Back up files and settings. Click next. On What to Back Up, select “Let me choose what to back up”. Click next. 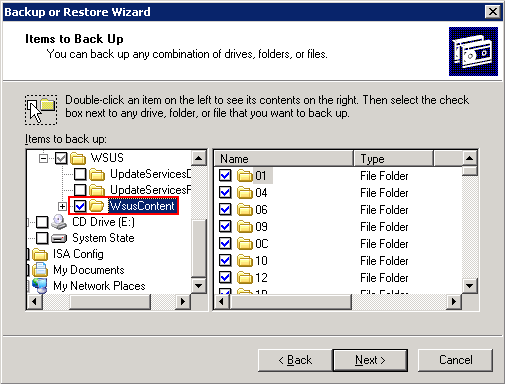 On Item to Back Up, browse to WSUSContent folder and check the folder. All sub directories will be also checked. Click next. 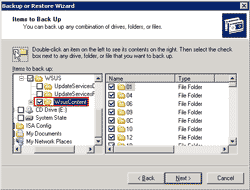 Note: WSUSContent is the folder in WSUS folder when installs WSUS. 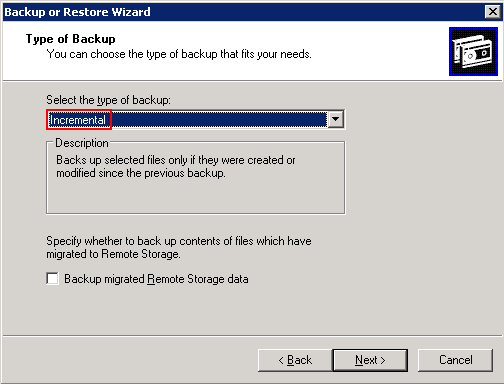 On Backup Type, Destination and Name, select where you want to backup. I choose D:. Click next. On Completing the Backup or Restore Wizard, click Advanced. On Type of Backup, select Incremental. Click next. On How to Back Up, click next. You can also select “Verify data after backup” if you want to validate it after backup. Click next. On When to Back Up, click next. On Completing the Backup or Restore Wizard, click Finish. When the backup is finished, you’ll have a file .bkf at the place where you have backup. This is the file that will be copied to the imported server. 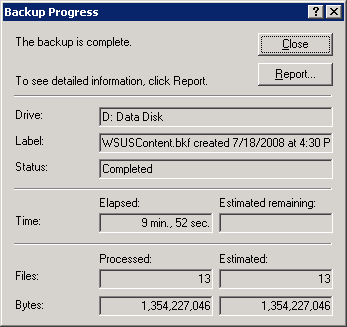 Next, I’m going to backup metadata. Open command-line to C:\Program Files\Update Services\Tools. type “wsusutil export export.cab export.log”. 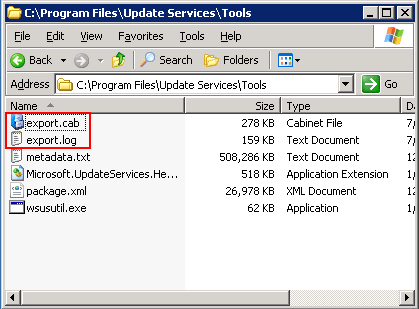 Note: This command will be exported metadata to a file called ‘export.cab’ and also create a log file called ‘export.log’ which for debugging. When export finishes, you’ll see the message as the figure below. 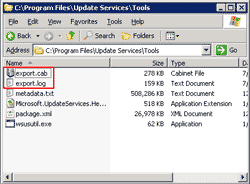 Navigate to C:\Program Files\Update Services\Tools. You’ll see export.cab. This file is the metadata file which will be copied to the imported server. Next, copy both .bkf file and .cab files to the imported server. The import will be shown in the next post. 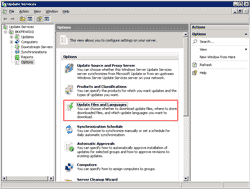 See Getting started with Microsoft Windows Server Update Services, Part VI: Disconnected network(2).